I was inspired by the vast number of Twitter birds out there and decided to provide my own entry the internet’s collection of our feathery friend. Everything is neatly packaged in transparent .png format, which means the bird will have no difficulty nesting in whatever site you place him in. Feel free to leave a link in the comments if you end up using any of the illustrations for a project – enjoy! Released under this Creative Commons license. While it’s not required, if you end up using any of these graphics, a link to this post would be greatly appreciated. 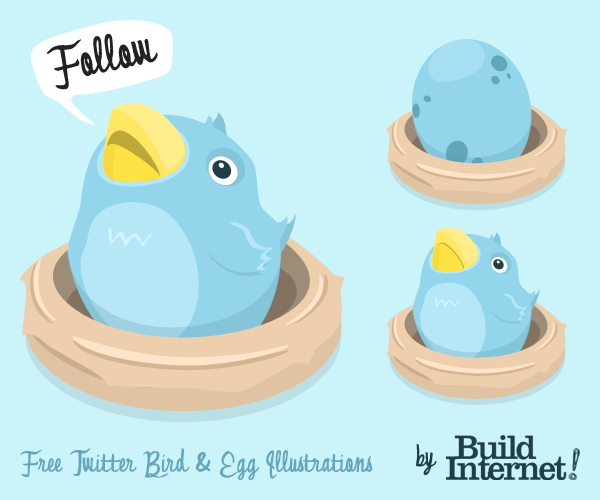 If you want to share this file with anyone, please link directly to this post ( http://34.194.222.226/2010/06/freebie-fiesta-twitter-bird-egg-illustrations/ ). *The font used in the above graphics is called Johnny Quest Classic. That is a great looking bird, thanks for the share. Good to see you guys back to posting more frequently. Thanks immensely for providing the icons. I’ve been looking around for a well designed icons, and I hope this will prove to be the ideal one I’m looking for. Hmm it seems like your site ate my first comment (it was extremely long) so I guess I’ll just sum it up what I had written and say, I’m thoroughly enjoying your blog. I too am an aspiring blog blogger but I’m still new to the whole thing. Do you have any recommendations for first-time blog writers? I’d really appreciate it.